Home December 1 2013 Vol. 33 No. 21 Columns Advertorial: Pluripotent Stem Cell Verification: Is There an Alternative to Teratoma Assays? Advertorial: Pluripotent Stem Cell Verification: Is There an Alternative to Teratoma Assays? Pluripotent stem cells have great potential for use in regenerative medicine and are an important tool for understanding developmental and disease mechanisms. Unfortunately, properly characterizing these cells in order to maintain experimental consistency is proving to be a time-consuming and difficult task. The defining characteristics of pluripotent stem cells, which include embryonic stem (ES) cells and induced pluripotent stem (iPS) cells, are straightforward: their ability to self-renew and differentiate into ectoderm, mesoderm, and endoderm germ layers. What makes characterization challenging is that heterogeneity within a given stem cell population can cause variability in the differentiation into important downstream lineages, such as cardiomyocytes and hepatocytes. To account for this high level of functional variation, verifying the pluripotency of stem cells—from the generation of a new cell line through its expansion for an experiment—is crucial. The most widely accepted method for determining whether a population of cells is truly pluripotent is the teratoma assay, that is, verifying in vivo a cell population’s ability to differentiate into each of the three germ layers via teratoma formation in mice. This method is time-consuming and costly, but failing to properly verify the cells can prove even more costly. Time and resources spent expanding stem cells are wasted if the resulting population is not functionally pluripotent. To address these difficulties, R&D Systems has developed new tools that aid in the verification of stem cell pluripotency during derivation, maintenance, and expansion. 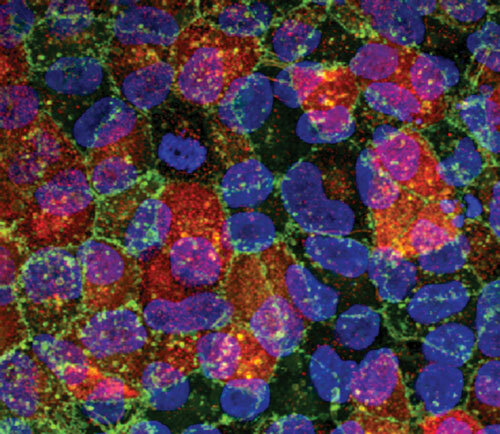 Generating iPS cells requires colony selection and cell expansion. Manually picking colonies that contain pluripotent stem cells is possible through an analysis of colony morphology. Colony picking is a tedious process, as it is both time-consuming and labor-intensive. Moreover, colony morphology is not truly indicative of pluripotency, since cells that are not fully reprogrammed can have similar morphology. The inherent unreliability of using colony morphology alone as a pluripotency indicator likely contributes to a significant amount of wasted effort. The GloLIVE™ Human Pluripotent Stem Cell Live Cell Imaging Kit and individual GloLIVE antibodies available from R&D Systems allow you to verify the pluripotency status of your stem cells by monitoring the expression of both positive and negative markers (Figure 1). The kit contains a set of azide-free, fluorochrome-conjugated GloLIVE antibodies that recognize two positive markers and one negative marker of human pluripotent stem cells. These antibodies are added to live, unfixed cells in a single-step assay that takes only 30 minutes and has no adverse effects on stemness or proliferation. This kit, used in combination with the analysis of colony morphology, promotes the selection of high-quality, undifferentiated stem cell colonies, thereby reducing wasted time. Despite its broad use as the most common assay for assessing the pluripotency of stem cells, the teratoma assay has limitations.1 It requires expensive animal models and is time-consuming, often requiring six to ten weeks before pluripotency can be determined. The teratoma assay is also inherently variable, depending on the site of cell inoculation and the mouse strain used. Additionally, teratoma analysis is not straightforward and requires significant histological expertise. Another assay used to verify functional pluripotency is in vitro embryoid body formation. This assay requires only one to two weeks before results can be obtained, but the results it yields can be highly variable since it relies on random differentiation of the stem cells. The inherent variability of results obtained via embryoid bodies and the teratoma assay, along with the significant time and expense required for teratoma formation and analysis, pose a degree of complexity and delay in the initiation of important downstream experiments. R&D Systems offers a kit that quickly and reliably aids in determining the quality of a starting stem cell population. The Human Pluripotent Stem Cell Functional Identification Kit verifies the pluripotency of your starting ES or iPS cell population in vitro in only five days (Figure 2). Achieving findings significantly faster than can the embryoid body formation process or the teratoma assay, this kit is also more consistent. The kit’s specially formulated media supplements and growth factors drive reproducible pluripotent stem cell differentiation. The markers needed to characterize each of the three germ layer cell types are also included in the kit. Although it may not be a replacement for the teratoma assay, this kit provides a valuable quality check of your starting stem cell population prior to initiating the more arduous teratoma assay. Furthermore, the rapidity with which the kit can assess cell populations makes it feasible to continually verify the health and differentiation capability of stem cell populations throughout routine culturing. This approach could prevent wasted time that results from the use of stem cells that were not ultimately pluripotent in complicated downstream experiments (Figure 2). Figure 2B. The low-quality starting ES cell population referred to in Figure 2A. 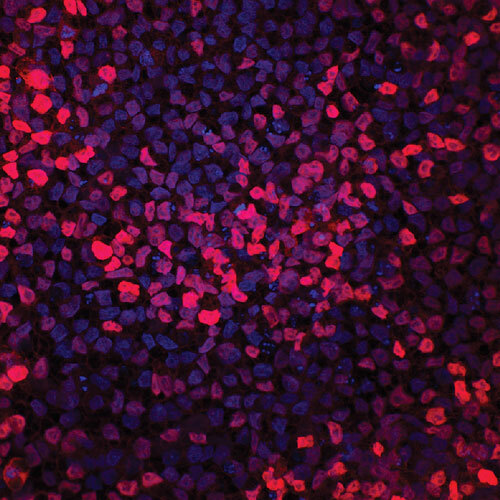 Despite the great potential that pluripotent stem cells have for advancing personalized medicine, the development of robust differentiation protocols has been hindered by the inherent functional variability within pluripotent stem cell populations. 2 Unfortunately, the current methods used to account for this functional variability can be inconsistent themselves. The GloLIVE Human Pluripotent Stem Cell Live Cell Imaging Kit, the individual GloLIVE antibodies, and the Human Pluripotent Stem Cell Functional Identification Kit provide additional tools for quickly verifying stem cell populations, thus, increasing consistency across experiments. Reducing experimental variability allows scientists to interpret experimental results with more confidence, aiding their efforts to advance research toward understanding important questions surrounding developmental and disease mechanisms. 1. Buta, C. et al. (2013) Stem Cell Res. 11:552. 2. Cahan, P. & G.Q. Daley (2013) Nat. Rev. Mol. Cell Biol. 14:357.